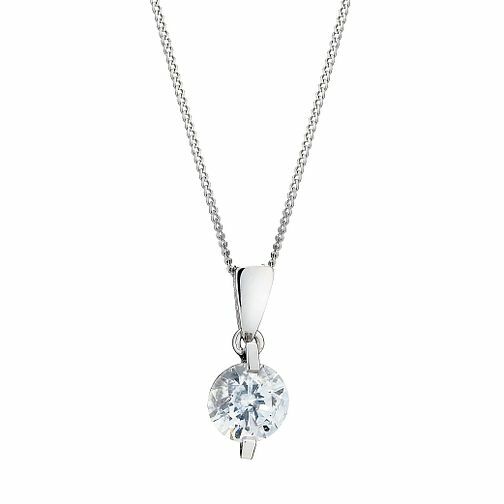 A delicate 9ct white gold chain necklace, set with a beautiful pendant made from Cubic Zirconia. Every Pure Brilliance Zirconia is marked with a microscopic engraving that is completely invisible to the naked eye. This seal serves as your assurance that you are acquiring stones of the highest precision and brilliance, which meet cutting standards. 9ct White Gold Cubic Zirconia Pendant is rated 4.0 out of 5 by 5. Rated 2 out of 5 by Anonymous from Pretty Had to take the item back to the local shop for exchange. This item was purchased as present for granddaughter for her graduation. The ribbon on the gift box just did not fit on. When she opened her present on day of graduation and removed the necklace the chain had a large knot in it which was impossible to undo. The necklace could not be worn, it was bought to wear at her graduation. Extremely disappointed.